Gear Ratio 1st 25.2, 2nd 16.65, 3rd 12.37, 4th 9.99, 5th 8.1. 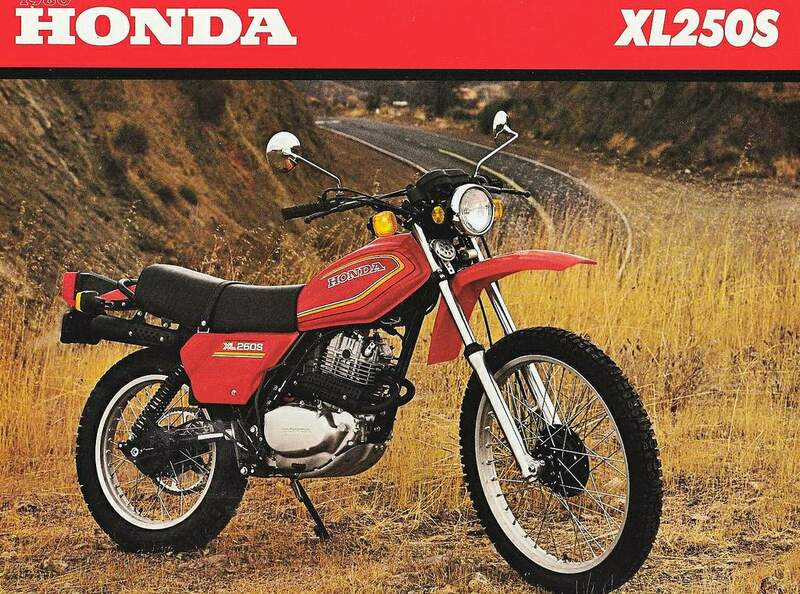 Honda's XL250 trail bike was at one time rather outclassed by its competitors as it was a great deal heavier and not nearly as potent. However, the XL250S is a much better machine with a lot less weight and an innovative new engine. The power unit of the 250 is an all-alloy single-overhead-camshaft single which features four valves, making its breathing easy and efficient. Power from the oversquare unit peaks at 20.2bhp at 85oorpm which gives the bike a top speed of almost 80mph, yet a fuel consumption which is decidedly frugal at 70mpg; on the road, of course. An interesting feature of the engine is its exhaust system which features twin pipes, claimed by the manufacturers to be superior to a larger-bore single unit for low-speed torque. Power is fed via a wet-multi-plate clutch and five-speed gearbox to the i8in rear wheel, which looks rather odd considering that the front is a massive 23m diameter. However, as has been found in motocross, larger front wheels make things a lot easier on really tough ground. The performance of the XL off the road is excellent and the bike is a lot more than just a trail/fun bike for it could well be a competitive club racer. Many trail bikes are hard to ride on tarmac purely because their extravagant, but which in reality is very necessary, for the bike thrives on revs and is not that powerful lower down the engine speed scale. For instance, if the bike is cruising at 7o-75mph in top gear and the rider runs into a strong headwind or starts to climb a motorway hill, the bike will lose pace fairly easily, thus necessitating a change of gear. This is even more pronounced when riding with a pillion aboard. HMMM, little embarrassing this. You'll probably notice throughout this giant test that there are a few words you may not have met before unless you're a devotee of American mags, the dirt riding ones in particular. Phrases such as 'shooting the berm' which isn't a way of keeping down the rodent population of Peterborough, or even the tadpole count of Carshalton Ponds, but in fact is a super-trick way of cornering off-road. Uh-huh, there's another: 'super-trick'. Plain ordinary 'trick' is bad enough. Then there's 'endo' meaning end-over-whichever way you're crashing; or 'zoot' which no one has ever satisfactorily explained but it sounds the part anyway. If you're lucky you may even spot a DNF or WFO, and Pete Watson expressed incredulity at an S-O-B which crept in. Dirt freaks will have spotted the relevance already and it's all part of the fun of riding off-road which is what this test is all about. For years we've bitched about road and trail compromise bikes saying they're too much one way and not enough the other. With European manufacturers, the bikes are ace on the rough but rough on the ace. The Japanese, as usual, have come up with what most people want which is a good road bike which can be taken off-road occasionally. But these days, riders are becoming more selective in what they want from their bike and the off-road handling characteristics of ordinary trail bikes are coming under closer scrutiny. For this we can thank, for once, America where there's been a huge explosion in sales of playbikes. The result is a keenly competitive market which has brought massive benefits in the development of the trail bike. That's in general handling, styling and chassis parts. But ultra-strict (and getting progressively stricter in coming years) exhaust emission and noise laws have also changed power units. For years, the two stroke reigned supreme with its high power with low weight and simplicity of layout — and noisy, smokey exhaust. Now all four Japanese manufacturers produce a four stroke trail bike and we've got the latest in one giant test. Things had started to go awry from the very beginning, before the Great Bike Lake District Task Force even got going. Back in April when plans were laid, importers contacted and dates arranged, it all seemed so simple. The morning of departure we still hadn't collected the very latest Honda XL250S — the only one in Britain had gone astray. It was finally located in somebody's front garden in Middlesex and ridden up by photographer Colin Curwood. And we should have realised that the Ramblers' Association were bringing in extraterrestial help in their bid to keep all bikers out of the Lake District National Park when Yamaha said they weren't having an XT500 on their test fleet 'cos they could sell all they could get anyway. We finally borrowed a 1977 model from Comerfords, those well known and respected dealers in Thames Ditton, Surrey, who specialise in off-road machinery such as KTM and Bultacos. 'Bring it back clean,' were Bert Thorn's last words, 'or we'll charge you £50.' A gentleman to the last. The other two bikes were no sweat — Suzuki's new SP370 and Kawasaki's KL250. So the scene was set: SP370 versus the XT500; XL250S versus the KL250. Going four stroke is good news to all riders who play around on the dirt (as opposed to those who aren't fooling) as they're generally easier to control than two strokes. On a thumper (sorry that's a term of endearment for four strokes), the spread of usable power is far bigger, extending far lower down the rev range than on a two stroke. 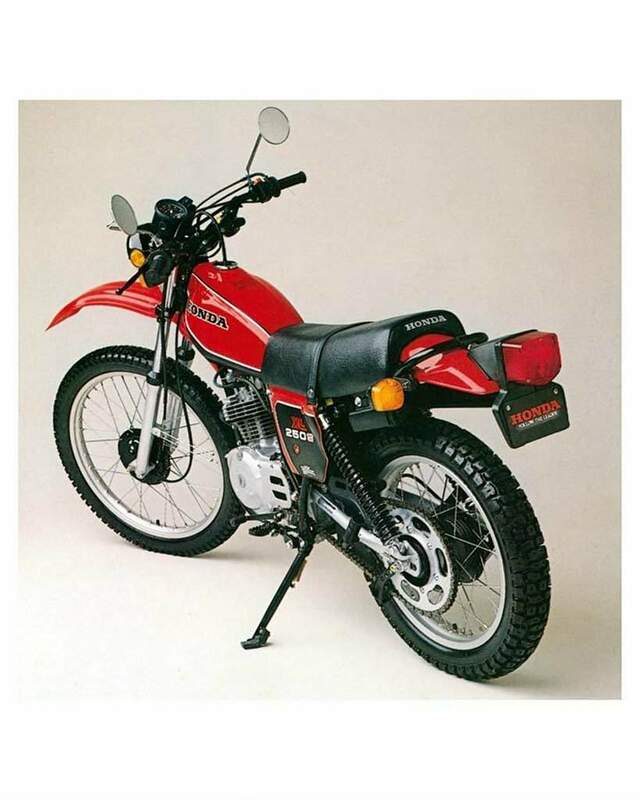 CCM boss Alan Clews once told me that his 500cc BSA-based moto cross machines produced over 20lb-ft of torque at 2,000rpm compared with the two stroke 400cc Maico's lowly 4lb-ft at the same revs. Of course, the Maico's more powerful and faster higher in the rev range but only an ace rider can use it. This low-down torque can get you out of trouble more times than you care to remember, particularly when caught in the wrong gear. The reason for this abundant power supply is that while a four stroke has mechanically controlled valves and a separate stroke for clearing out burnt exhaust gases and sucking in a new petrol/air mix, a two stroke has to do both these things in one go (that's a simple comparison of the two types of internal combustion engine that'll have any physics teacher cringing). The point is that a two stroke can only be tuned to move all these gases efficiently over a relatively narrow rev band — and naturally there's a fair wastage of unburnt mixture. The Honda and Suzuki were ridden up to our base at Dungeon Ghyll, deep in Great Langdale near Ambleside, while the other two were trailered up behind a car full of spare riding gear, inner tubes, tools, tape measures and Elastoplast. This was, after all, going to be a serious dirt riding weekend and we wanted to be prepared for all possibilities such as bent bikes, people, etc. Not only that but we're suckers for trick riding equipment such as enduro tool bags, moto cross boots and gloves, y'know the stuff — anything that makes a dummy look the part. What we hadn't prepared was ourselves. Nice couple of days' trail riding, no problem we thought. As we swung off the tarmac onto the first trail, the western end of Garburn Pass, the playing around faded. A steep, rocky, wet climb faced us that proved to be easy compared with what lay ahead. Neither were we prepared for the hottest day so far this year and we'd forgotten that it was Bank Holiday weekend when every rambler that ever there was decided to go for a walk in the Lake District. Despite the congestion, which wasn't so bad anyway, we had a ball. We played Martin Lampkins over the rocks until we got tired and it became more like Chris Bonnington (mountaineer, jerk) riding a yak; we toodled along easy bits admiring the breathtaking scenery from angles that no car-bound moron could ever contemplate; we met some nice people, including a guy who worked for Kawasaki UK in Slough. For anyone wishing to go trail riding in the area, get the one-inch OS Tourist Map on which most of the RUPPs marked are still okay. If you've got time, zoom into the Cumbria Council office at Kendal and check with their master map 'cos there are some good byways which aren't marked as such on the map. We can recommend the Garburn Road and Pass which starts near Troutbeck and goes to Kentmere. Nearby, there's the nicely named Till's Hole and then the challenging but worthwhile Gatescarth Pass which looks over Haweswater Reservoir at its summit. Some of these trails are not for the faint-hearted and be prepared for hard work. A final conclusion about the bikes: the KL's good but the XL's better. The XT's great on tarmac but a tank off-road where the SP walks all over it. SP versus XL? Well, the SP almost DNFed when Mr Watson 'adjusted' the handlebars and I for one preferred the Honda, mainly for its lack of bulk. But that extra power is real useful and the SP's suspension is better too. Hang in there, I guess it just depends on who gets the holeshot . . . COMPROMISE is a nasty thing; no-one is ever really satisfied, though honour is said to be done. It happens to all of us — governments can't keep their election promises; magazines aren't allowed the front covers they want; and motorcycles fall into that void between what bikers say they want and what manufacturers are prepared to make. But once in a while, they get it together and now Honda, pushed by the American west coast's mania for off-road riding, have the XL250S. Sticking my neck out, I'll say this is the best dual purpose trail bike I've ever ridden. It's got all the goodies which make for a civilised street bike, yet the engine and chassis are a cool combination on the dirt. For sure, it's not in the out-and-out full-blown enduro class, but it'll cope quite well with anthing anyone other than an ace is prepared to attempt. Throughout the weekend, it became easily my favourite off-road and yet was comfortable, reliable and fun during the five-hour flat-out blast each way to and from the Lake District. 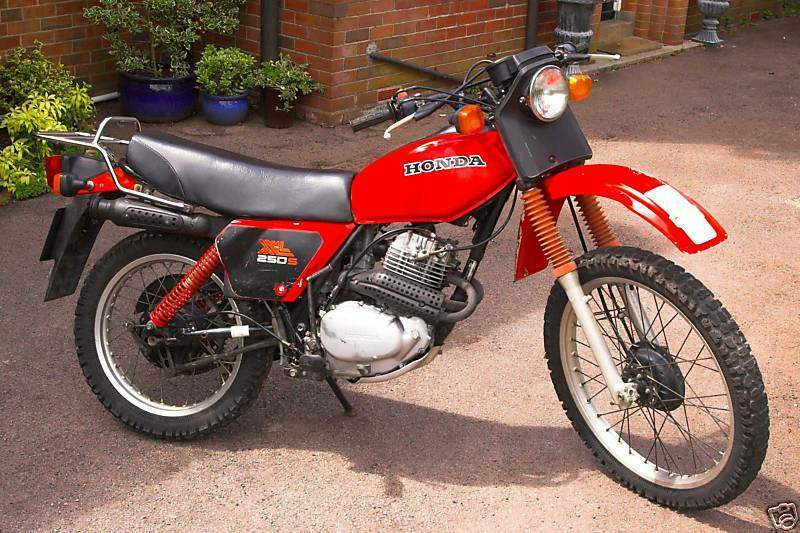 Here I'll admit to a soft spot for the old K series trail Honda, for it was on one of those pedantic plodders that I did my first off-road1 riding. But the S is just so different that it's hard to believe they have anything in common. Bore and stroke are unchanged, and the four valve cylinder head retained, but apart from this the engine has been completely redesigned which, say Honda, has allowed them to carve off weight elsewhere. Vibration is a problem for single cylinder four strokes and unless you're prepared to pay for exotic lightweight metals, the frame tends to be fairly heavy in order to resist vibration-induced cracking. Two balancer shafts, chain-driven from the crankshaft, cancel out the effects of the vibration. One is mounted forward of the crankshaft and the other, in a very neat manouevre, is concentric with the gearbox mainshaft. But what with these two chains and a cam chain whizzing round, there's a lot of tensioning going on which needs to be checked regularly. And those chains probably need replacing after 20,000 miles, as many CB400F owners are finding. Despite the intricate weaving of exhaust plumbing around the frame tubes the silencer does an efficient job of being unobtrusive and produces an unusual, but pleasant, noise. The two exhaust pipes provide the correct 'tuned' length and contribute to the abundance of torque at low revs. From just above tickover, you can have the clutch fully home in any of the first three gears and the engine will pull quite strongly. It's not the slow, thumping of heavy-flywheeled singles of the past but rather a determined surging that's unwilling to stall. Torque and bhp have not been raised significantly over the K3, but now there's three-quarters of the total 14.5lb-ft of torque available as low as 2,000rpm, rising gently to the maximum at 6,000rpm. This means that the gears can be fairly well spaced, spreading from a very low first gear to fifth, which gives a respectable cruising speed — and fuel consumption. On the ride up to Ambleside alongside the SP370, the XL250S recorded exactly the same consumption despite running near maximum speed all the while and obviously working far harder than the bigger bike. It starts easily too, though I doubt the value of the cable linking the kick start mechanism to a decompressor. Or there again, perhaps that's why it starts so easily. It's quite amazing how it'll go up steep inclines, pulling a high gear at low revs, which is the best way to find grip. It'll be even better off-road with some decent tyres. No doubt you'll have heard of the miracle sticking power on tarmac of Honda's hole-in-the-middle knobblies. Well, they're fantastic on the road all right and it would be hard to match their angles of lean with a standard road tyre. But on anything other than dry, hard-packed dirt trails on moderate slopes, they're a liability. On grass or in mud, you're on a very fine edge of control and on damp rocks, there's just no cutting edge to find grip-After a weekend's riding over rocks and the long haul on the road, small stones filled the centres of the knobs and the edges of the tyres shows signs of fraying. After wearing them out, if I owned the bike, I'd opt for conventional trials or scrambles tyres. No bad idea though, is the 23 inch front wheel which rides over obstacles easily and helps contribute to the 10 inches of ground clearance. It's easy to see how Honda have lopped 101b off the frame weight alone, bringing the whole plot down to 2601b. The engine is suspended from a single downtube and single top tube, bolting onto the light gauge duplex sub-frame at the rear. Three sheet steel tie-braces across the top of the sub frame don't exactly inspire confidence as to the robustness of the frame, but a masterpiece of ingenuity is the way Honda have managed to squeeze the air filter and silencer in between the two plastic side panels. The small six volt battery is left hanging from a plastic box on the right and the tool kit is suspended from the sub frame just behind the left shock. As usual, it's a cram fit for the tools which don't allow the owner to do much beyond adjusting the chain. That the bike is so comfortable on and off road is partly due to the leading axle front forks which give a claimed eight inches of travel and partly to the long, softly sprung rear shocks giving seven inches at the axle. That's about right for a trail bike since it doesn't mean you need a four-inch heel to touch the ground. The ability to give a reassuring 'dab' is a must — and often unavoidable anyway. Damping is critical with such long travel, however, and while the XL feels great on the road right up to its 80mph maximum, the rear end starts to jump around a bit when giving it the gas along bumpy trails. It was nowhere near as bad as the other three machines though, and this behaviour is probably an inevitable result of that nasty compromise mentioned at the beginning. For picking along, though, there's no problem and coupled with a good turning circle and light steering provided by the straight-across yokes, the XL makes a good tool for playing at Rob Shepherds (he's Honda's man in the British trials championship). It must have taken a brave designer with many second thoughts to have left off the rev counter, an item which must rank as one of the most useless items to have found its way onto street bikes, let alone dirt bikes where you're busy enough looking where you're going without checking whether you're in the right rev band or not. Instead there's a six-inch wide rectangular console containing a speedometer on the right and an easily spotted mileage recorder and trip meter on the left. The value of this is twofold: first, the fun off-road rider can see how far he's been and how much fuel he's likely to have left; second, the competitive enduro type can gauge, with the aid of a watch, how close he is to his schedule. And instead of opting for the ubiquitous high-rise scrambles handlebars, Honda have designed their own low-profile bars, with a tie-strap, and finished in matt black. They're comfortable and nothing higher is needed, partially because the 23 inch front wheel and long forks raise the front end anyway. They fit in nicely with the overall riding position and the cleated and spring-loaded footpegs are in just the right place. Part of the civilisation process are those neat levers and switchgear, the comfy seat and adequate 35 watt headlamp. A bash plate of sorts is fitted under the engine but it offers little protection to the gearlever or brake pedal — unlike Yamaha's XT500 guard. No chain tensioner is fitted despite the long chain required by the massive rear sprocket, and the puny chain guide slung under the swinging arm soon became bent beyond recognition and had to be removed to avoid fouling the sprocket. Honda's PR blurb says the indicators are rubber mounted, but they definitely weren't on our test machine and proved difficult to remove. Overall though, the XL250S is a good step forward for dual purpose bikes as it's reasonably light, slim (12 inches across the crank-cases which is the widest point of the bike's body), and has a good spread of power. If I wasn't so British I'd say it was getting near to being super-zoot . . .
ARE YOU ever glad that you're not Japanese? I am. More particularly, I'm especially happy that by some fortunate coincidence 1 wasn't born about thirty-odd years ago in Japan and didn't go to work for the motorcycle division of Kawasaki Heavy Industries when I left engineering college. Okay, I might have been in on the birth of the Z1 or the two-stroke triples, but with my luck the chances are I'd have ended up getting involved with the design of the KL250. In which case I'd have been very happy at first and then extremely sick shortly afterwards. The reason for this gloom would have nothing to do with any foul-ups I might have made on the KL. It's a very well built 250 four-stroke single trail bike. As with any dual-purpose dirt/road machine the emphasis is more on road than dirt, but it's good. 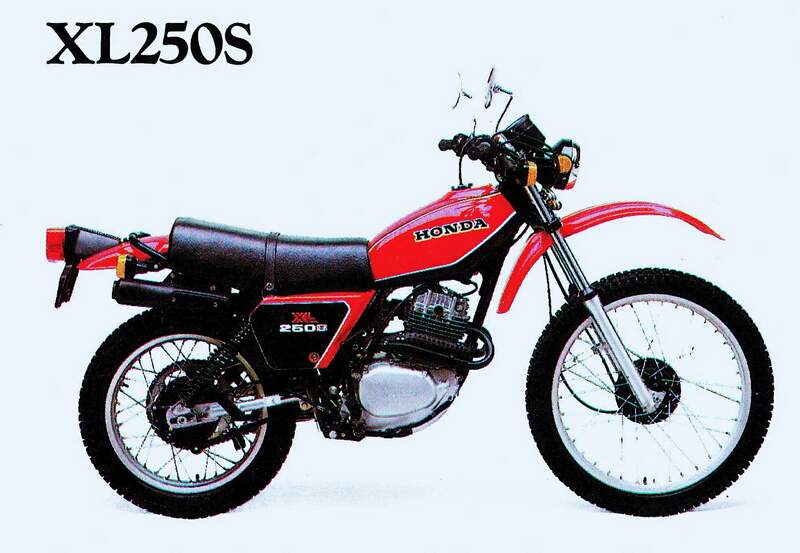 There's just one problem: Honda's XL250S is measurably better. It's a cruel world. In January Bike tests the KL250 and concludes that it's far and away better than Honda's old quarter-litre XL. Come April and what's all this? Kawasaki's careful upstaging of the ageing Honda trails-ter is hit by an act that features several startlingly novel concepts like a sohc, four-valve, balancer-shafted dirt single with twin ports mounted in a lightweight frame and a 23in front wheel wearing the strangest looking tyre you've ever seen since Dunlop launched what was to become the TT100. Kawasaki have had only one real weapon at their disposal — they were out there in the shops first. And since, among bikers, word of mouth recommendation has to be worth almost as much as a zillion-pound advertising budget, they have had a head start. But Honda — not to mention Suzuki are right there behind them now. When I first rode the KL I'd only just recently had a spin on a Z200 road single and — being in a vaguely logical frame of mind — noted down a question for Kawasaki UK. What relationship was there between these two sohc, four stroke single engines? Answer: very little. They emanated initially from the same basic design operation but in detail they're very different with none of the ready interchangeability of parts we've not come to expect from the Japanese, who can be very logical. Their gearbox layouts must be almost identical but apart from that their dimensions, 66 x 58mm and 70 x 64mm, bear no easy 'bored and stroked' relationship. Yet they feel the same. They're both red-lined at 9,000rpm and while the 200 might feel like an overgrown CB125S, the KL comes across like a pumped up Z200. There's more bottom end for trickling between those cruel Lakeland rocks and just as much whizz 'n' whirr to get you through the five speed box and hurtling down the A1 to London indicating 70mph at 7,000rpm. The good things are indeed good. For a six-volt system, good lights. Plus indicators that come off rapidly for a foray on to the rough, DID alloy rims, neat colour-impregnated plastic guards — with a plated steel inner at the rear and plenty of clearance up front — effective brakes and a comfortable riding position. Yet despite its lowly price tag of £699 you still notice the areas that aren't quite up to its competitors' standards. It's low on ground clearance — at 8.25in static unladen, the lowest of the four — and needs a more substantial bash plate. That silly downswept exhaust pipe will clobber rocks just after you've lofted the front wheel (more of an effort than on the Honda) over them. There's no chain tensioner fitted which is a must for the rough, and although the KL feels light it is in fact over 30lb heavier than the Honda. Even the SP370 is a tad lighter at 287lb. Worse still on the road, its lack of really effective vibration isolation for the rider results in a painful vibro-massage for feet, seat and hands if you keep the revs around 7,000. However much I may personally dislike the concept of complex balancer arrangements, Honda proved to me at least over that punishing weekend that less vibes spells more pleasure. And if you aren't doing it for fun, give up now. Strangely enough, however, we did discover something more about the KL on those incredible Lake District trails than the fact that it's basically a jolly good road machine. It is, but we also found it to be the easiest of the four bikes to ride when we were tired and damaged or just plain physically knackered. Providing you didn't ask it to do things for which it was plainly not designed, such as crossing the Irish Sea or attempting a trials section, it pulled the less experienced dirt riders like Colin Curwood and myself through unscathed. Its front wheel does not come up so suddenly or deliciously as on the SP370. It remains obstinately earthbound unless you exert a great deal of rearward weight transfer and manage some nifty work with the throttle and front brake. Likewise it won't turn on you like an XT when you've got your mind in neutral. It demands little and still manages to give a lot. Throughout my period with it, the KL responded to a thorough beating on road and trail with supreme equanimity. The big end is a caged needle roller, the crankshaft supported on ball and roller bearings of a substantial size. It felt nigh-on indestructible even if it is highly conventional. I warmed to its neat little details like the combined ignition/steering lock now copied by Yamaha. The simple idea of having two coils per shock to provide dual-rate springing appeals as it has done since I met it on the KT250. Its conventional trials universal tyres felt more secure than the Honda's devices on slippery going like a traverse across a steep hillside covered in short coarse grass. I just plain enjoyed whanging it around town where its steering geometry and suspension made just as much sense as on rocks or piling up a rutted pass. FOR YEARS the motocross and enduro boys have been using trick setups on their bikes, specifically designed to help keep the power on the ground (where it belongs) and improve the handling of their very powerful mounts under very difficult conditions. If you've ever watched a motocross CP meeting you'll know what I mean. It's only natural that sooner or later some of the more logical developments that have taken place should end up on the street — or more to the point on yer actual dual-purpose machine. Suzuki's development boys down at Hamamatsu have obviously drawn upon the wealth of experience gained from their exhaustive contesting of the world's motocross and enduro rounds in producing the SP370, their first four stroke trail bike. At first sight, the SP looks like it's gonna be heavy (and at 287lb with a gallon of fuel it's no lightweight) but once moving it feels remarkably light, nimble even. The frame is a single downtube tubular steel job, splaying out into a smaller diameter cradle under the engine which is protected by the smallest perforated metal bash plate I have ever seen. Although small it certainly worked; not once in all our sump bashing up in the Lake District did it fail to protect the engine. frame to ensure good ground clearance (9Viin ain't bad for a trail bike). The matt black paintwork with buffed fin edges conceals an overhead cam, twin valve mill with an 85 x 65.2mm bore x stroke with a relatively mild compression ratio of 8.9:1. The power characteristics are super smooth, and the lack of flywheel weight makes the engine feel more like a gutsy two stroke rather than a big plonker. Power comes in right from the start and just keeps coming, no sudden increases to watch out for. Although a handful of throttle will lift the front wheel without any effort, the motor is very docile. There's still heaps of power available if you need it and, with standard gearing, 70mph cruising on the road is no problem. Naturally, it's a bit high for dirt use — I don't think I ever got out of second while blatting up and down the Lakes. P'raps that's more to do with my cowardly nature than any fault of the bike's. Starting the bike was no problem. A nice hefty stomp would fire it every time, but just in case you don't know what compression is there's a small window on the right hand cam cover and when a small silver screw head appears, it's time to stomp, just like the one of the XT500. I personally feel they are a complete waste of time besides being difficult to use — what are we becoming, a nation of pansies? Lubrication is by wet sump with a 2.8 pint capacity and a neat little window on the side of the gearbox casing for easy checking. The styling of the bike is super-trick, with the whole tank and seat/rear mudguard assembly flowing together as one unit. A good example of neat/simple/functional design. Check out the pics they speak for themselves. Perhaps some of the other bike manufacturers could take a leaf out of Suzuki's book, or alternatively steal their designer. Even the exhaust system is good. It doesn't appear to be made out of cast iron, nor does it wind itself in and out of huge boxes full of intricate baffling systems. It is small, unobtrusive and yet still succeeds in bringing the 370's bark down to a civilised burble. It can be done boys, Suzuki have just done it. No doubt it even satisfies the super-strict US emission/noise restriction laws which brought about those horrible heavyweight exhaust systems that have adorned our trail bikes in the past. Even the ramblers couldn't hear us coming before it was too late. There's a lot to be said for that! Unfortunately, while the bike definitely has the manners — the frame, suspension and engine — to make a good dirt bike, there are one or two niggling little points which were too road-orientated. Why for instance didn't Suzuki fit a lightweight enduro-type lighting system instead of the oversize/overweight headlight and rear lights fitted? After all it's only chucking out six volts anyway. The speedo and rev counter could have been junked in favour of something akin to the system used on the new XL250S from Honda. A rev counter may be needed on a screaming multi, capable of reaching 12,000rpm, but it surely isn't necessary on a big, easy going single. I know, I know, the market research men are all going red in the face telling us it's a compromise bike and that most trail bike owners in Britain don't even ride around on their front lawns let alone the Carburn Pass. Fair enough, but consider this. The junking of all those excess bits, besides improving the bike's suitability for the dirt would have improved the bike's road manners (because of the drop in weight) and wouldn't affect its comfort ratings either. My only major beef with the bike was why the hell didn't Suzuki fit a chain tensioner — a bike chucking out that sort of torque is gonna eat chains for a pastime. Without some form of buffer between the engine and the rear wheel, it ain't gonna do the sprockets a lot of good either. My advice to anyone who buys one is to fit one mucho rapido — it'll be worth it in the long run ('scuse pun). Bitchin' apart, the bike features some logical developments in the suspension and braking fields that bode well for the future of trail bikes. Like Honda's new XL250S, the Suzuki SP370 has got leading axle front forks. This system has advantages in that not only are longer travel suspension systems possible but also the inertia of the front wheel mass is moved backWards towards the centre of the bike, which is where it should be. It improves the tracking of the front end while cornering and braking by not altering the steering geometry as radically as conventional centre axle forks. On the road and on the dirt the bike's suspension was more than adequate, the Kayabas on the rear only bottoming after death-defying leaps into space, which after all is quite natural — the bottoming out, dummy, not the leaps. Another development that's been a long time in becoming a standard feature is the fully floating rear brake. Basically this consists of the swingarm and brake stay being parallel to each other and pivoted at each end. When the swingarm describes its arc, the plate mirrors it precisely, due to the formed by the swingarm and brake stay. What this means in practice is that the rear wheel is less likely to hop about under braking or while hitting the whoopdees due to the brake rod applying varying force to the brake because of the movement ot all the component parts clanging around somewhere underneath your bum. Another way of solving this problem is to fit a brake cable because a cable applies a constant force regardless of all the suspension movement. Just to be on the safe side Suzuki have fitted one of those as well. Nice. The handling, braking, power and attractive lines of the SP370 must make it a winner for Suzuki. Apart from the niggling little things I've pointed out, this is without a doubt the best trail bike I have ridden to date. Anybody wanna buy my slightly used XT500? Only 7,000 miles on the clock; hardly used in anger; Preston Pettys; Girlings . . . . ? THERE'S one really good point about Yamaha's XT500 trail bike: it makes one helluva road bike. After the trail test up in the Lake District, I took the bike down to Cornwall and back, and despite the trials tyres which gave me the odd very worrying moment, I thoroughly enjoyed the ride. As an off-road bike, it's not exactly a failure but it's fair to say that the rider is less in control of his destiny than he would really like. The XT has the most power cubes of the four bikes and it shows. On the road, a maximum speed of around 90mph proves it's no slouch. It's a full third bigger in capacity than the Suzuki SP370 and while it doesn't leave the SP standing, it'll bulldoze any hill it cannot climb. But that sohc, all-black engine is the Yamaha's best point and coupled with a less-than-average rolling chassis, it'll get you into more trouble than you want. The XT's problem lies mainly with its size, weight and frame geometry; an all-up figure of 3201b is fantastic for a 500cc road bike (the SR500 road version weighs 3601b) but that mass off road needs muscles that can only be earned from a Charles Atlas course. Come to think of it, riding an XT could well be part of the training. pension in on the act as well it has to be big. The fork legs protrude a full "PAin from the top yoke, but even so the front end towers above, say, the Honda XL250S. With a seat height of 33in, it's a stretch even for six-footers. Suspension-wise, it's quite good and certainly very comfortable on the road, absorbing most craters and potholes easily. On the rough the forks are good enough to take as much punishment as most average riders can deal out, but the rear units tend to bounce around a fair bit instead of accurately tracking the rear wheel. One problem here is that the bike's mass is so great that the rider's own efforts sometimes have little effect. Suddenly the bars snapped round and that was it. Picking myself up, mentally X-raying every bone, I was amazed to find that the goddam s-o-b hadn't even got a scratch on it though for sure it picked the hardest piece of mountainside for its pilot. Once you're in trouble on the XT, it doesn't really help you — it's too cumbersome for tight nadgery stuff. It's more at home in wide open spaces and especially mud, glorious mud, where all that low-down torque will find grip. To be fair, our test XT had a carburation fault in the pilot jet stage which meant it wouldn't tick over slowly and shutting the throttle tended to lock the rear wheel as the engine stopped firing. We couldn't adjust this at the time 'cos the lummock who had ridden the bike prior to trading it into Comerfords, had Loctited the air screw into the carb body. As a result, going uphill also meant using far more revs than we would have liked. A good XT can be plonked uphill at around 2,000rpm with no fuss. nice, controllable wheelies in first gear just by zapping open the throttle. Watch those trials tyres if you're into popping wheelies though; I did an involuntary donut in a garage forecourt trying to be a smartass. The 1978 models should be even better at this for they have a new carb with an accelerator pump fitted. As the throttle is snapped open, neat fuel is injected into the venturi momentarily richening the mixture to cope with the sudden inrush of air. It's the same carb as fitted to the street SR500 and Yamaha claim it has upped the power by two bhp to 32bhp at 6,500rpm. Either to cope with the extra power or because they've had problems before, the cylinder head fins have been made larger to aid heat dissipation. There could be room for improvement in the cylinder head cooling as most American tuners, who have done some amazing things with the stock engine, fit an extra oil supply line to the rocker gear — Bill Emmison of Berm Specialities imports the Protec oil line. Other improvements to the '78 models include being 'graphically redesigned' meaning they've given it a new paint job. Dry weight has been reduced by around 101b down to 3041b, the saving coming mostly from manufacturing the 2.3 gallon tank from aluminium instead of sheet steel. Gaiters are fitted to the front forks which would be a sensible move even for a street bike. Protecting the fork sliders from dirt will extend the life of the fork seals and bushes by as much as 500 per cent. Several other nice touches abound on the XT which further confuse its role as a pretend enduro bike. All four indicator lamps have flexible rubber mounts so in a gentle prang, the mounts bend rather than snap. Once the pressure is off, they spring back into place. WUh the other three bikes, we had to remove the indicators during the off-road session, but not on the XT. It was also the only one fitted with a rear drive chain tensioner even though being a rather inferior sliding type rather than the rolling wheel variety, it was not too efficient. Again, Berm Specialities import an American tensioner which Yamaha could do well to simply copy. The sump protector, or bash plate, is the most effective of the four being a massive aluminium plate held by four bolts onto the frame. Not only does it completely protect the crankcases and gearbox from rocks but the gear lever and brake pedal gain some measure of cover. Inspecting this plate afterwards when I did an oil change before going to Cornwall, the number of graunches and scars on it proved its effectiveness but perhaps also demonstrated the need for greater ground clearance. It is indicative of the revolution that the XT500 started that most dealers expect to sell few this year. They reckon most people who bought them over the past two years did so because they wanted a big, four stroke single rather than a trail bike. Thus, the new SR500 will fill that niche. But for those stalwarts who are prepared to persevere with the XT, there's a wealth of after-market chassis and engine tuning parts which will either make life easier, or confirm that Japan is about to make a moonshot. As you may realise from the number of plugs he's already had in this story, most of them are imported by Bill Emmison and his address is: Berm Specialities, PO Box 4, Willerby, HuK.